First off, let me just say thanks to those of you who haven’t abandoned my blog. I want so badly to be consistent and write all the time, but when months go by without doing anything really new, I just feel that no one really cares. I could blog about things like what I eat (I had cereal for dinner tonight), my dog (he’s snoring beside me on the couch) or my travels (I went to JoAnn’s for interfacing last weekend), but I’m not sure anyone really cares. We’ll just call it a creative block for now. I am getting ready for some holiday craft shows in the next few weeks though, and it’s requiring that I actually finish some work. Most of what I’m working on is standard fare for my shows, but what is new are some patchwork quilted scarves. I’m using cotton batting and fleece, along with the cotton patchwork for the front, and after washing them, they’ve turned out so soft and squishy. 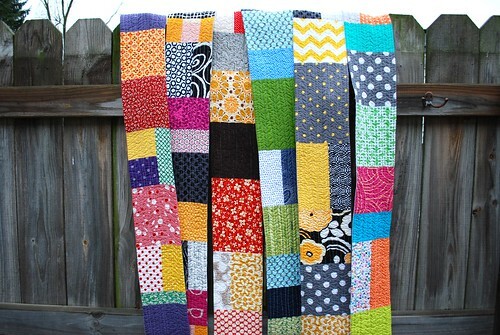 They are every bit like a quilt, and I love the idea of having a mini quilt to wear out in public on cold days. We’ll see how they do at my upcoming shows, but I really, really love them. In fact, I’m a little worried they’ll be hard to sell–mainly because I’m unwilling to let them go. I can wear 5 or 6 of them at once, right?